Vietnam’s former imperial capital, Hue (spelled Huế with Vietnamese tonal markers) is a small city in Central Vietnam. Located close to Da Nang and a short distance from Hoi An, Hue is an excellent place to learn more about the history of imperial Vietnam. Hue was a combat location during the Vietnam War, and as a result many of its historical sites were damaged during the war. Despite the damage, almost all of the city’s historical locations are open to visitors, including the incredible Imperial Enclosure. Our quick guide to Hue covers the city’s main areas of interest, the best things to see and do, Hue’s best hotels in a variety of price ranges and good places to eat and drink in the city. Hue is a small city that’s fairly easy to navigate. Almost all of the city’s attractions are located on the northern side of the Perfume River, with a selection of hotels, guesthouses, restaurants and bars across the river on the southern side. 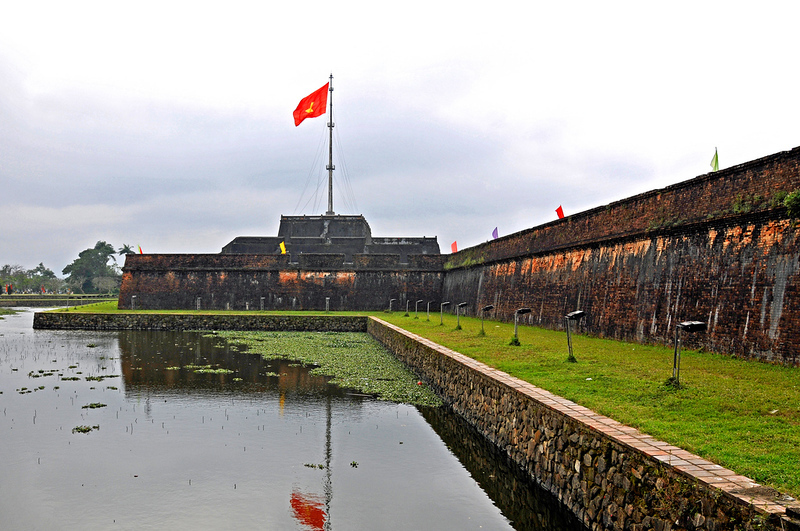 The Imperial Citadel was once the seat of the imperial Vietnamese government. 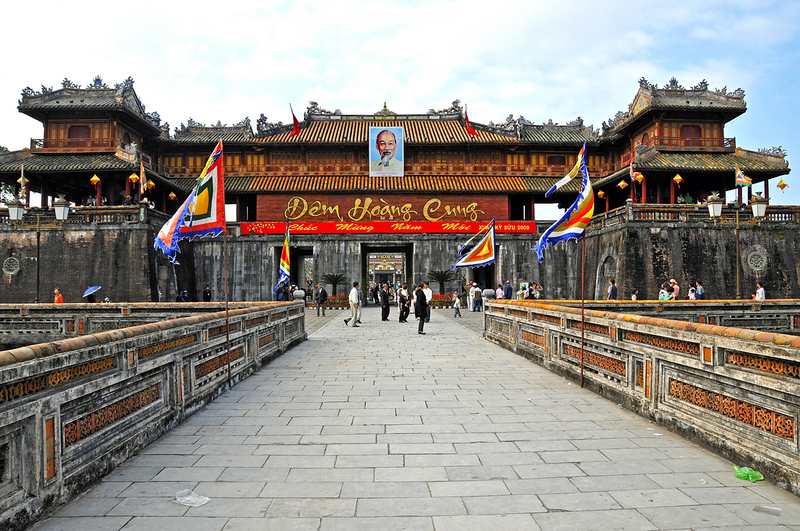 Today, it’s the largest and most popular historical site in Hue, attracting both individual travellers and groups interested in learning more about Vietnam’s history. Many of the buildings that make up the citadel were damaged during the American War (as it’s known in Vietnam) and the war with France in the 1940s. The citadel was attacked both by the American troops and by the Viet Cong during the bloody Tet Offensive in 1968. This means that large sections of the citadel area are empty, with some damage to the existing buildings. The citadel area is large and requires several hours to see in full — we recommend spending at least two hours here. This was once the emperor’s coronation hall, is one of the standout buildings of the complex. Hue’s Imperial Tombs house the remains of Vietnam’s former leaders. There are seven tombs in the city of Hue, although only a few are of interest to tourists. The Tomb of Emperor Minh Mang is the best known and most popular of the tombs. Built using a Chinese architectural style, this tomb was completed during the mid 19th century and sits on a quiet section of land approximately 12km from Hue. This was the first of Hue’s tombs to be built. Constructed from 1814 to 1820, it’s located on the bank of the Perfume River. Because of its remote location (it’s more than 20km from Hue) the Gia Long Tomb is best visited with the Tomb of Emperor Minh Mang. Finally, the Tomb of Khai Dinh is one of Hue’s most impressive tombs. Built from 1920 to 1931, it’s located atop Chau Chu mountain, approximately 10km from Hue. The tomb, which blends Western and Vietnamese architecture, is located at the top of a long stone staircase. The Perfume River runs through Hue, making it a useful navigational landmark that can come in handy as you explore the city. Most of the city’s attractions are on the north side of the river, with a good selection of hotels and several of Hue’s backpacker hangouts on the southern bank. As the former capital of Vietnam, Hue is a major historical destination with a variety of temples, tombs, pagodas and palaces. You can find historic sightseeing recommendations in the “Main Areas of Interest in Hue” section above. One of the best ways to experience Hue is from the water. Cruises run along the Perfume River throughout the day and into the evening, offering you a chance to see a side of Hue that most travellers miss out on. Surrounded by tropical farmland, the area around Hue is perfect for motorcycle trips. Local tour companies like Hue Adventures offer guided motorcycle tours of the Central Vietnamese coast that are the perfect opportunity to see Vietnam’s gorgeous scenery. Bach Ma National Park is a natural reserve and former French hill station located just over an hour from Hue by road. The park’s elevation (its tallest peak is 1,450 metres above sea level) and coastal location make it a great place to enjoy the rugged scenery of Central Vietnam. Although Hue isn’t a major beach destination, there are several beaches within 30 minutes of the city by taxi or private car. Thuan An Beach is the closest to Hue and offers a mix of clean, clear water and serene, uncluttered sand that’s tough to find elsewhere in Vietnam. The Indochine Palace Hotel is one of Hue’s most luxurious hotels, offering a variety of spacious rooms and suites. Facilities are outstanding, with a beautiful outdoor swimming pool, a variety of lounges and restaurants and a spa for guests. Located 10-15 minutes from Hue’s centre, Pilgrimage Village Boutique Resort & Spa is a quiet five star resort that’s surrounded by lush jungle. Rooms here are large and comfortable, with a rustic and relaxed feel. A great option if you want to be away from the activity of the city. Quiet and remote, Vedana Lagoon Wellness Resort & Spa is a luxurious resort located 30 to 45 minutes from Hue by taxi or private car. While its location isn’t convenient for exploring the city, Verdana Lagoon’s spectacular surroundings and facilities make it an excellent place to stay. Located a short walk from the Perfume River on the south side of Hue, Asia Hotel is a modern four star hotel with a variety of clean and comfortable rooms and suites. Facilities include a spa, small swimming pool and outdoor dining. Another mid-priced option on the south side of Hue, Alba Spa Hotel has a range of modern and comfortable rooms. Facilities include a mineral pool and luxurious spa, which offers a variety of treatments for guests. Moonlight Hotel Hue is a four star hotel located on the southern side of the Perfume River. One of many small, comfortable boutique hotels in Hue, Moonlight’s large rooms and great facilities make it one of the best mid-priced options in the city. Holiday Diamond Hotel is a cheap and simple hotel located on the southern side of the Perfume River, a short distance from the Imperial Capital. With a selection of clean and cosy rooms, this is a great accommodation option for travellers on a strict budget. Another budget option in the southern part of Hue, Jade Hotel Hue has a good variety of clean and simple rooms. This is one of the few budget hotels in Hue that offers family-sized rooms for groups of four people. Located a short walk from the Perfume River, Serene Shining Hotel is a simple three star hotel that delivers great value for money. Rooms here are simple, clean and comfortable, with lots of natural light and high quality modern furniture. Located inside La Residence Hotel, Le Parfum is a luxurious French restaurant with a range of dishes, wines and desserts. This restaurant’s high-end decor and location make it one of Hue’s best choices for romantic dinners. Ancient Hue is a high-end Vietnamese restaurant with a great selection of classic and less well known dishes. Tables are located inside a beautiful garden, making this one of the best places in town to enjoy perfectly prepared Vietnamese food in a quiet, relaxing setting. Another riverside restaurant, Ben Xuan Garden House Theatre serves excellent Vietnamese and French food. Thanks to the restaurant’s remote location, Ben Xuan is quiet and peaceful, with excellent views of the sunset over the Perfume River. A backpacker favourite, Nook Cafe & Bar serves a great variety of Vietnamese and international dishes at very fair prices. It’s best to write down this restaurant’s location before you visit, as it’s quite difficult to find on a small alleyway. Another popular option with backpackers, Family Home Restaurant serves up a great range of Vietnamese dishes. 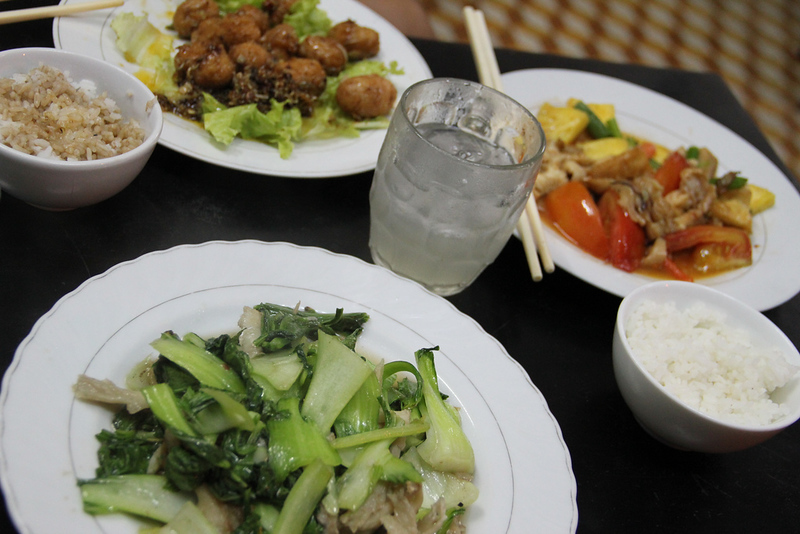 Thanks to its large variety of meat-free and vegan dishes, this is one of the best places to eat in southern Hue for vegetarians and vegans. Tree Coffee is one of the best places in Hue to enjoy fresh Vietnamese coffee. In addition to the coffee menu, Tree Coffee serves a variety of juices, smoothies, sodas, traditional herbal drinks and teas. One of Hue’s biggest cafés, The One Coffee & Bakery is a great place to enjoy fresh espresso, cake and baked goods. Free Wi-Fi and large tables make this a great place to relax and regain your energy or find new things to do after exploring the Imperial CItadel. 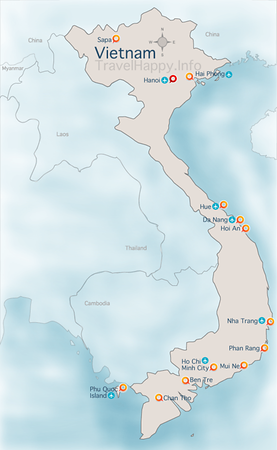 Hue is fairly easy to reach from either of Vietnam’s major cities, with direct flights and trains from Hanoi and Ho Chi Minh City connecting Hue to the rest of the country. Hue has a small international airport, with flights from Ho Chi Minh City and Hanoi arriving on a daily basis. Currently, Hue’s Phu Bai International Airport is served by Vietnam Airlines, Vietjet and JetStar Pacific. If you’re travelling to Hue from outside Vietnam, you’ll be able to travel to the city by flying into Da Nang International Airport and making your way to Hue by taxi. Prices for a taxi to Hue from Da Nang range from $45 to $55 USD, depending on the type of car and availability. Check Skyscanner to compare airlines for the best prices and flight times to Hue. Hue Train Station is one of many stops on the Hanoi to Ho Chi Minh City railway that covers the vast majority of Vietnam, making Hue easy to reach by train if you’re willing to tolerate the slow speeds and long distance. If you’re travelling from Hanoi, the best way to reach Hue is with a first or second class overnight train ticket, which will give you a relatively comfortable bed for the trip. From Ho Chi Minh City, it takes upwards of 20 hours to reach Hue, with similar first and second class bunks available. Since train travel in Vietnam is very slow, it’s best to avoid this method of transportation unless you particularly want to see the Vietnamese countryside. Flying into Hue is always the quickest option, and thanks to budget airlines like Vietjet it’s barely more expensive than using the train. Hue is connected with other cities in Central Vietnam by bus. Buses run from Hoi An at 3:30pm daily, making the trip to Hue in approximately three and a half house at a cost of 210,000 dong. Buses and minivans are also available from Da Nang, offering a convenient route to Hue if you fly into Da Nang by air. While buses to Hue are available from Hanoi and Ho Chi Minh City, they generally aren’t recommended due to the very long travel time.